They say life is what you make it, so celebrate the life you've made with that special someone with this commemorative Floral Frame Mr. and Mrs. Custom Wedding Cutting Board. - Measures approximately 16" x 12"
- Special DyeTrans® material ensures your design will transfer beautifully to this cutting board. Flowers are synonymous with celebrations, love, and life. From birth announcements, to wedding ceremonies, anniversaries, and Valentine's Day, flowers are always a symbol of beauty and growth. 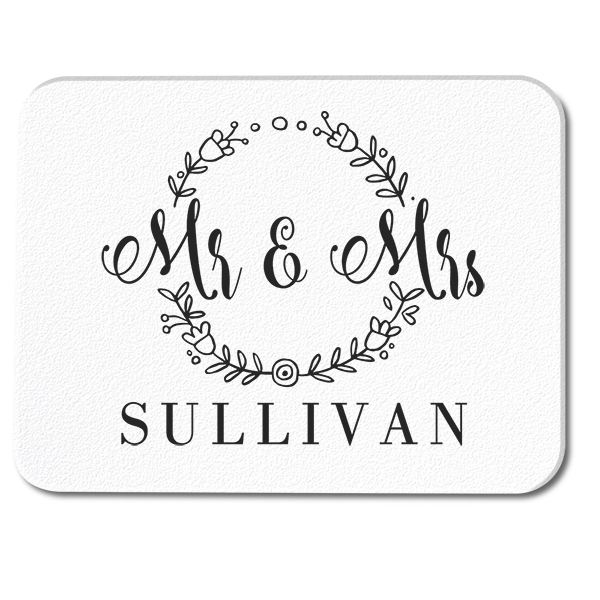 Celebrate the beautiful blossoming marriage of yourself or a loved one with this Floral Frame Mr. and Mrs. Custom Wedding Glass Cutting Board, which makes an excellent commemorative gift.